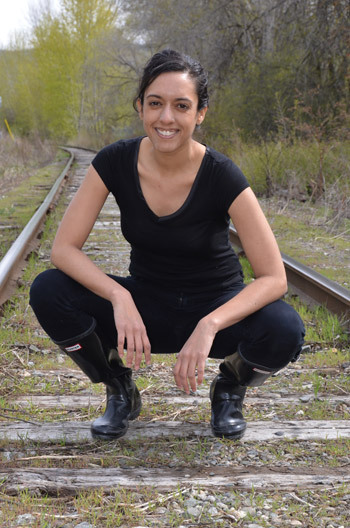 Sonnet L’Abbé is crossing the country by train to hear Canadians’ stories about Canada’s upcoming 150th birthday – and will write a crowd-sourced poem about the upcoming celebration. Given thought to Canada’s upcoming 150th birthday? Our sesquicentennial is just around the corner – how should we celebrate? What do we love about being Canadian and how can we show it in local and nationwide events in 2017? Sonnet L’Abbé seeks answers to those questions and more. An award-winning poet and culture critic who teaches creative writing in the Faculty of Creative and Critical Studies at the University of British Columbia’s Okanagan campus, L’Abbé has embarked on a two-month whistle-stop tour aboard ViaRail, talking with Canadians about our country at Year 150. The discussion is called 2017 Starts Now. It involves a series of CBC-sponsored regional conferences featuring speakers from academia, business, arts and culture, media and community groups. Beginning in Vancouver, Calgary and Toronto last month, the steel-wheels excursion was in Saskatoon earlier this week and continues to: Winnipeg, Friday, May 3; Montreal, Wednesday, May 8; Charlottetown, Tuesday, May 21; Moncton, Thursday, May 23; St. Johns, Monday, June 3; Halifax, Tuesday, June 4; Yellowknife, Thursday, June 20; and Ottawa, Thursday, June 27. As she travels from city to city, L’Abbé is tweeting, blogging and writing poetry about her interviews with Canadians. The CBC has also commissioned L’Abbé to write a poem about Canada that she will present to an audience of national leaders at the final conference in Ottawa. “I want to call out to all Canadians to help me make a ‘crowdsourced poem’ to mark the beginning of this important conversation,” says L’Abbé. Anyone can contribute to the Canada poem. Use the hashtag #2017 to tweet your answer to one of these question: How should we commemorate 150 years of Canada? What is it about being Canadian that we should celebrate most loudly?